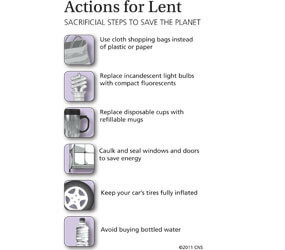 WASHINGTON – As Lent begins with Ash Wednesday March 9, Dan Misleh wants to remind Catholics that it is not just about giving up chocolate or ice cream for 40 days. Instead, the executive director of the Catholic Coalition on Climate Change would like to see Catholic families and individuals make some permanent sacrificial changes that will also contribute to a more sustainable and more just world. “The whole issue of climate change is about consumption and lifestyle,” said Misleh of the changes the Washington-based coalition would like to see implemented far beyond the Lenten period. “Lent is the perfect time to examine our lifestyles,” he added. Even giving up a food item like chocolate or ice cream “reminds us that we do need to live more within our means, more in touch with people who don’t have any of these things,” Misleh said. The coalition – which includes Catholic organizations representing the U.S. bishops, health care providers, teachers, men and women religious and a wide range of others – is promoting the St. Francis Pledge to Care for Creation and the Poor, through which individuals, families and institutions promise to pray and learn about environmental issues, assess their own contributions to climate change, act to change their choices and advocate Catholic principles and priorities on climate change. Pope Benedict XVI – dubbed the “green pope” for his support of environmental initiatives at the Vatican – has been critical of what he sees as a lack of worldwide commitment to mitigating climate change. But he also said that the devastation of the world’s forests, the spread of its deserts and the pollution of its water cannot be reversed without moral education and changed lifestyles. As a next step in that educational process, 24 newly trained “Catholic climate ambassadors” will begin making presentations to parishes or schools this spring, especially about “the need for solidarity with the poor, who are the ones most impacted by climate change,” Misleh said. Among the other resources available to raise awareness about the need for global solidarity are the Lent 4.5 faith-formation program developed by the Passionist Earth & Spirit Center in Louisville, Ky., and Catholic Relief Services’ Operation Rice Bowl. – Use cloth shopping bags instead of paper or plastic to reduce the estimated 380 billion plastic bags distributed in the United States each year, according to the Environmental Protection Agency. – Replace incandescent light bulbs with compact fluorescent bulbs. The U.S. Department of Energy says that if each U.S. household replaced just one bulb, it would save enough energy to light 3 million homes for a year and prevent 9 billion pounds of greenhouse gas emissions each year. – Give up disposable paper products such as napkins and paper towels. – Use a refillable mug instead of disposable cups. One coffee drinker using disposable cups can generate 22 pounds of waste in a year. Operation Rice Bowl, now in its 36th year, allows even the youngest family member to feel a certain solidarity with the hungry of the world. The program encourages families or parish groups to plan at least one simple, meatless meal each week and donate the money saved to CRS, the U.S. bishops’ overseas relief and development agency based in Baltimore. Prayer and education also are key components of Operation Rice Bowl. CRS provides free materials that include stories and recipes from five featured countries – Haiti, Indonesia, Senegal, Honduras and Kenya – as well as bulletin announcements, homily suggestions, lesson plans for grades one through 12, and downloadable placemats and coloring pages. “Lent asks us to break old habits and form new ones,” says a Lenten reflection prepared by CRS for Ash Wednesday. “This Lent, consider giving up eating between meals. Replace it with a fast that physically calls to mind the deep desire of the poor to find solutions to the root causes of hunger and economic insecurity. For more information about the resources mentioned in this article, contact the Catholic Coalition on Climate Change at http://catholicclimatecovenant.org; Catholic Relief Services’ Operation Rice Bowl at http://orb.crs.org; or the Lent 4.5 program at www.lent45.org.